Okay, so I don’t run yet….at least not for very long…but it is not out of the realm of possibility. 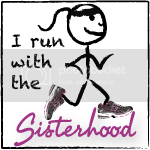 Ironically, I decided to toy around with C25k about a week ago, before The Sisterhood announced their virtual 5k on January 8. They chose that date to cheer on a number of the Sisters who are running half or whole marathons in the Disney Marathon the next day (including my good friend Kirsten who is totally rocking her marathon training!). Sadly my toying around with C25k has been derailed after only 2 sessions because of heel pain. This problem actually started a few months ago, when my biking training was ramping up, and it was helped greatly by proper biking shoes and rolling a tennis ball under my foot in the morning. I can’t say it was completely healed, but enough that it only bothered me every once in a while. Unfortunately, after two days of C25k, with not the greatest shoes (not the worst, but certainly not designed for running), I am now limping nearly full-time. My first order of business is to get this heel healed (say that three times really fast!). I had already suspected that it was Plantar fasciitis, but had gotten a bit complacent, since the pain wasn’t as bad any more. Now I’m going to be a bit more vigilant about getting rid of the pain – Kirsten suggested freezing a water bottle and rolling the icy bottle under my foot, so I’ve started trying that. I think for this week I’m going to stay off my feet as much as possible, stretch w/the tennis ball and water bottle, and ice my foot. Any other suggestions out there would be welcome. Even in my current condition, though, I know that I could walk a 5k…er…limp a 5k, I suppose. So I’m signing up to support my fellow sisters. My main challenge, I think, will be the weather  January is not exactly the best time to be doing things outside in the DC area, and I don’t have access to a treadmill, so I’ll just have to make it work somehow.